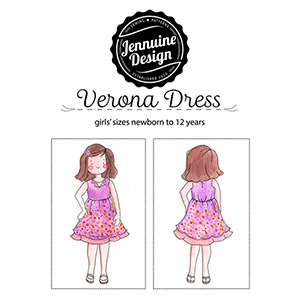 The Verona Dress is a soft and sweet dress with a fun folding collar resembling a notched suit collar. A longer underskirt gives the perfect canvas for playing with fabric combinations. Comfortable, fully-lined bodice with enclosed elastic at the back. Optional short, long, or cap sleeves. The smallest sizes have an opening with button loop at the back for ease in dressing. Optional patch pockets and tulle accent make this dress exceedingly customizable! Suggested fabrics are lightweight cotton jersey, rayon challis, lawn, voile, poplin, broadcloth, shirting, Swiss dot, linen, eyelet, or chambray.